Taking personal pride and satisfaction from the challenges and enjoyment of driving. Always driving to a constant high standard that protects yourself and helps all others that you encounter on the road. BE ALERT, BE WISE, BE SAFE. New powers come into force that could lead to millions of fines being handed out to motorists by police for committing driving offences they did not know existed. Under the new offence of 'careless driving', motorway drivers hogging the middle and outside lanes, and those who tailgate, could be slapped with on-the-spot fines of £100 and three penalty points on their licences. Up until now police have had to pursue offenders through the courts. According to a survey carried out by Populas on behalf of the AA, 29 per cent of drivers - about 12 million - are at risk of falling foul of the new legislation. They admit to hogging the middle lane of the motorway on a regular basis. And roughly 40 per cent of younger drivers fall into this category, admitting they stay in the middle lane in free flowing traffic because they incorrectly believe it to be the 'cruising lane'. Under the Highway Code, both the middle and outside lane are designed for overtaking only. In future, those caught lane hogging, tailgating or talking on the mobile phone when driving will have to fork out £100, instead of the £60 fine faced up to now. We are looking for people who would be willing to give their time providing transport to the users of services. What this means in practice is driving the older people of Leicester and Leicestershire to their appointments, to the shops, to social engagements or anywhere else they need to go. This is vital support for some of the more isolated members of our community. Our volunteers are reimbursed at a rate of 45p per mile. If you are living in Leicestershire it is a safe, thoughtful and methodical way of driving. Advanced drivers are more observant and better at anticipating changes in the surrounding conditions. Because of this they are able to plan their driving to deal with any circumstances. You can join us as an associate member if you wish to for you will already have passed your driving test to enable this. The RoSPA test is merely an assessment of your current driving skills to an accepted advanced level. You will have had free driving tuition of several hours to identify and assist you in honing your driving technique and skills to help you pass the benchmarks of bronze, silver and gold. 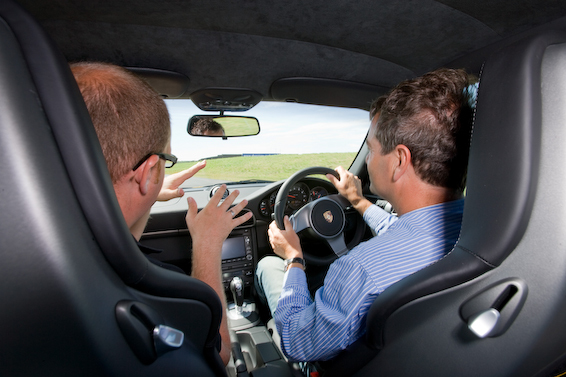 In a relaxed, informal drive you simply have to show that you have understood and put into practice in your test drive the advice and skills of roadcraft given to you by your personal tutor in your preparation. Advanced Driving is based upon the 'System of car control' as detailed in Roadcraft – The Police Driver Handbook. It is unlikely that anyone will gain a high grade without a good knowledge of the current editions of The Highway Code and Roadcraft. Advanced drivers and riders have been proven less likely to be involved in a road traffic incident! Advanced driving and riding techniques teach you the most cost effective way to drive, to keep fuel consumption to a minimum! By using the 'system of car or motorcycle control' techniques, your driving or riding will be smoother, resulting in less wear and tear! We have a range of benefits for members who pass our test, including insurance discounts. We will look at keeping in touch through social media.